Maria Adams caught this excellent summer whiting at a Tin Can Bay Fishing Club Junior Fishing Days – on again April 8 and it is free! From robotics and lego, to casting a line or bringing home a planter box! Look at what is on for the Easter break…. CCYAP Easter Craft 10am-2pm at the Cooloola Coast Community Complex. In conjunction with the Easter Fair, there’s colouring in and bunny craft. CCYAP Bling Your Bike from 12pm-3:30pm at the Easter Fireworks Carnival on the Tin Can Bay foreshore. Get creative with crepe paper and enter the Bike Decorating Competition at the Carnival. Competition fees apply. CCYAP Mini Commonweath Games from 9am-11am beside the Tin Can Bay library. Games for all ages that will have everyone running and jumping for joy while burning off some of that Easter chocolate! Enjoy free fun pool games 2 – 3pm at the Tin Can Bay Swimming Pool. Beat the heat and join us! Bring swimmers, towel, hat, sunscreen and water bottle. Robotics Fun for 5-17 years – come and try Ozobots, Sphero, Cubetto, Codeapillar and Bee-Bot, just for the fun of it. Join us at the Tin Can Bay Library 10.30-11.30am and the Rainbow Beach library at 2-3pm. CCYAP Head to Toe from 10am-11am at the Rainbow Beach Community Hall. How well does you brain talk to your body? Fun games that involve your heads and shoulders, knees and toes. 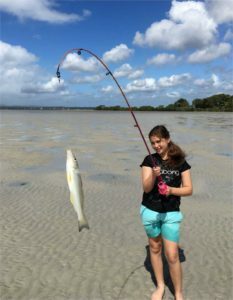 The free Sunfish Junior Fishing Day is on again 8am – 1pm, at the Norman Point Picnic Hut, Tin Can Bay for juniors between 7-15 years of age, hosted by the Tin Can Bay Fishing Club. Sunfish Level 3 three instructors will be available to provide tuition, training and assistance. CCYAP Working with Wood from 11am-12pm at the Cooloola Cove Veterans and Community Hall. Make a mini planter box to take home. Limited places so bookings essential, call Jess 0411 218 254. Lego Competition for 5-13 years – bring along your Lego to make a fun creation. Awesome prizes to be won! There will also be some Lego you can borrow. Join us at the Tin Can Bay Library at 10.30-11.30am and the Rainbow Beach library at 2-3pm. CCYAP Games and Gaming from 9am-11am at the Cooloola Cove Veterans and Community Hall. Card games, board games and computer games galore so bring the family for some interactive fun. Are you looking for more fun family things to do? Check out our Visitor Guide and the ads in this newspaper – you could cruise the Sandy Straits, stand up paddle board, kayak with dolphins, learn to surf, dive at Wolf Rock, experience a horse ride on the beach or go on a safari past the Coloured Sands to the lighthouse!